Advice used to be when talking to your customers; act like a big business even if you are small, as if you would lose credibility for being a small business. The belief was that large companies with household names somehow possessed a mysterious power to be better at business! In the last few years we’ve seen a shift take place. Companies like American Express, FedEx and the United States Postal Service have introduced small business campaigns to help compete with the big companies. It’s now cool to be small. It’s cool to be on Main Street rather than on the huge retail park in the city. Let’s look at this from the perspective of a Tutoring Business Model, do we go big and buy into a big name or stay small-town? As a franchisee of a big name tutoring company you could buy into the brand of the ‘Mother Ship’ and all of the advantages that brings to the table; a turnkey business, marketing, branding, testing, curriculum and a tutoring business model that has already proved itself in the marketplace. 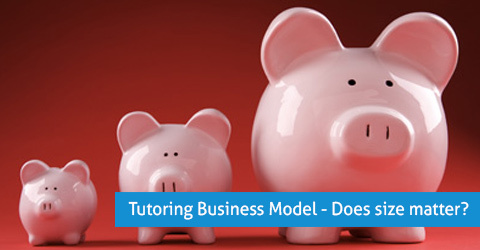 But does a small-town tutoring business model give you more flexibility? Doing it yourself means you have the freedom to run your business in a more flexible manner. This is why the ‘small-town phenomenon’ has been taking place. Small business owners can make decisions quickly, ideas don’t need to be run by corporate, you can join in activities with your neighboring businesses and jump into local marketing campaigns without staying within the lines drawn for you. Small companies are therefore seen as more flexible, more personable and are perceived as giving better customer service. This brings us back full circle to the franchise tutoring business model and the question of whether a franchisee can appear to be a ‘small town’ business. Ultimately the answer lies with the tutoring business model you are thinking of buying into, but keep in mind that the reputation of the franchise brand can be damaged at any time by another franchise owner on the other side of the country. This is just one of the dangers of working with a household name. With every business decision you should always weigh all options. There are pros and cons with both business models, but which model allows you to better control your own destiny? Software to manage your business is important regardless of size. Oases Online is the complete tutoring management package from small to large business. Check out the Features & Benefits of Oases Online.